Egypt’s future lies at the end of a brand-new asphalt road that arcs through the Eastern Desert, a grand project wrapped in a few pieces of ragged tarpaulin and framed by an enormous sky. The landscape is part sci-fi dystopia, part Wild West; the silhouettes of oversize wheels and pile drivers grind slowly against the horizon, while strange pods and skeletal boxes rise from the sand. “Our aim is to build a new Egypt,” Abdel Fattah el-Sisi, the military general turned dictator, told the United Nations soon after his rise to formal power in 2014. At the heart of this new Egypt — as imagined by the country’s leadership — are the beginnings of a new Egyptian capital, constructed from scratch in the dunes some 30 miles east of Cairo’s city center. So far there is little to see but fragments: the outlines of a restaurant complex, the foundations of a mall, an army-owned hotel clad in wooden scaffolding. Each section is managed by a different conglomerate of companies, most of which are enmeshed with the higher echelons of the state. The only completed element appears to be the ceremonial platform from which Mr. Sisi will one day inaugurate his alternative metropolis, a stony mound thrust high into the air that overlooks a neat grid of parking spaces and helipads in the foreground, and emptiness beyond. From some angles, the platform projects solidity and permanence; try to fit it in with its surroundings, however, and it looks like a rickety stage set that could collapse in an unexpected gust of wind. I clambered up the steps and across the plastic sheeting with an Egyptian colleague. “We are building our home in the apocalypse,” he said eventually, after staring around him in silence for some time. Six years after the start of the revolution that toppled President Hosni Mubarak and sent the Arab world’s most populous nation into turmoil, Egypt’s foundations are less secure than they might first appear. True, the trappings of old-school authoritarianism are more in evidence now than ever — from the 60,000 political prisoners believed to be languishing behind bars to the spate of forced disappearances to the government crackdown on authors, journalists, cartoonists and human rights defenders. Unauthorized protest is illegal, and a sweeping antiterrorism law gives the state the power to designate anybody it doesn’t like as a militant. Tired regime survival tool kits have been sharpened with fresh intensity. Certainly to his many Western allies, including President Trump — who has described his Egyptian counterpart as a “fantastic guy” and accepted a congratulatory phone call from him on election night, ahead of any other foreign leader — Mr. Sisi appears to be a recognizable face in an increasingly unrecognizable region: the Middle Eastern strongman offering a binary choice between tyranny and chaos. The reality is different. Egypt’s 2011 revolution was not an aberration that can now be buried under tons of cement, but rather the first manifestation of an extraordinary historical moment in Egypt. Its central fault line is a struggle over whether politics is to remain the preserve of elites, or whether the defenses around the existing model of power can be swept away by a tide of popular sovereignty from below. This struggle has deep roots, and it has now been out in the open for more than half a decade. It will continue, in different forms, for many years to come. Mr. Sisi’s ruling project, which justifies itself with an appeal to stability, is curiously unstable: It lurches from crisis to crisis, each revealing new cracks in the architecture of political authority, each accompanied by new levels of official violence as part of a futile attempt to beat the state’s contradictions back into submission. The regime cultivates a chauvinistic nationalism intended to increase its legitimacy, but at the same time is dependent on financial support from regional allies. When one of those allies, Saudi Arabia, demands the settlement of a land dispute through the transfer of islands in the Red Sea, the government acquiesces — prompting thousands of Egyptians to take to the streets in anger. The regime promises social justice but presides over an economy in which inflation is rampant, austerity is biting and living standards plummeting. The regime insists its curtailing of democratic freedoms is necessary because of a war against radical Islamists, but security lapses continue and the perpetual need to conjure up fresh demons means that some of the most popular figures in the country — most recently the soccer legend Mohamed Aboutrika — end up on the terrorist watch list. The regime attempts to prove to the international community that it is open for business, but then flounders in a morass of conspiracy theories when the body of Giulio Regeni, a young Italian Ph.D. student, is found on the side of a highway, his nails and skin marked with signs of torture. 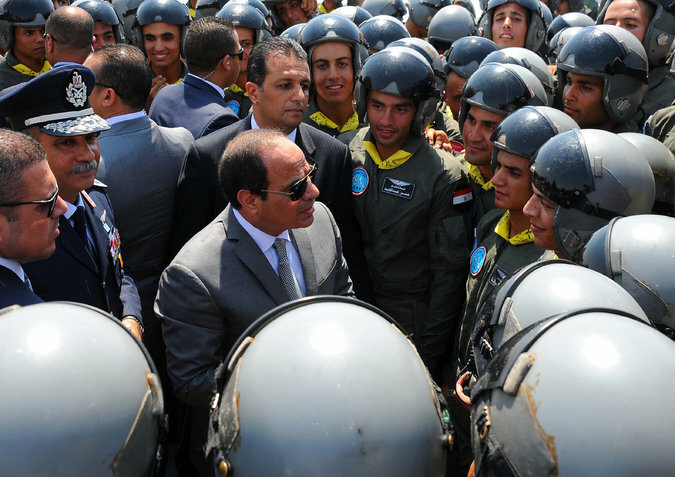 Like Mr. Trump, Mr. Sisi is reigning over the ashes of a broken political order; more so than Mr. Trump, however, he is a creature of that broken order and incapable of articulating the new. Egypt’s younger generation, weaned on television images of barricades and tear gas, and veterans of their own personal battles with patriarchs in the classroom, mosque, factory floor and family dining room, do not accept the status quo as immutable. Our conversation was interrupted by the arrival of what appeared to be a police informant, listening in and occasionally muttering into a phone. Tarek and Mahmoud, used to navigating the complexities of Mr. Sisi’s Egypt, deftly steered us outside so that we could continue talking elsewhere. The future they want to create is irreconcilable with the one represented by the police informant, and the system that sponsors him; the future Egyptian capital in the Eastern Desert, with its neatly demarcated segments of conventional authority and V.I.P. parking for those with private helicopters, is incompatible with the messy, contested Cairo from which the Hussein brothers have emerged. The future is indeed vague and foggy, far more so than the confident proclamations of Egypt’s rulers suggest. And who will shape that future remains fundamentally up for grabs. Driving back from the ceremonial platform to the main road, we passed a group of day laborers huddled around a fire. Behind them loomed pieces of a huge wall, more than 20 feet high, which is intended to eventually encircle the new city.